September courses begin officially on August 13, the focus weekend takes place September 8-9, and final assignments are due October 12. This course will use a broad toolbox to help students understand how to bring alive connections between the story of God’s people in Scripture and the story of our lives today – as individuals and larger communities. Students will read broadly in topics ranging from constructive theology to current events. We’ll learn to study scripture through exegesis and eisegesis, and use the framework of metaphor to learn to identify modern day parables and connections. Early work will include reflections on several readings, class work will include deep work with parables, and a final project will involve writing (or otherwise communicating!) samples of public theology. Some course instruction will take place electronically. The Rev. Benedict Varnum serves as rector of St Augustine of Canterbury in Elkhorn, Nebraska, where he also serves as a diocesan Trustee and a member of the Disciplinary Board. He holds a humanities AB from the University of Chicago in Fundamentals: Issues and Texts, and an M.Div. from The Divinity School at the University of Chicago. Ben keeps an occasional blog about faith themes in pop culture at rootweaving.wordpress.com (which may be a helpful early aid in understanding part of his approach to our topic! ), and is planning a podcast on faith and film with his wife, Megan Griffiths. He has previously served as an instructor at BKSM in systematic theology coursework. Brueggemann, Walter. The Prophetic Imagination (Second Edition). Minneapolis: Fortress Press, 2001. Watson-Epting, Susanne. Prophetic Voice of the Deacon. Association for Episcopal Deacons Monograph Series #19, 2008. Whittall, Maylanne. Citizens of the World - Servants of Christ . North American Association for the Diaconate; 1994. The monographs by Watson-Epting and Whittall are available to purchase as downloads at http://www.episcopaldeacons.org/monographs--working-papers.html . Watson-Epting, Susanne. Unexpected Consequences: The Diaconate Renewed. New York: Morehouse Publishing, 2015. The purpose of this course is to introduce students to the Bible, both Old and New Testaments and begin to answer some fundamental questions, such as: Where did the Bible come from? What are its sources of development? What do we believe about authorship? What is the cultural context of our sacred scriptures? What translations exist and why do they matter? 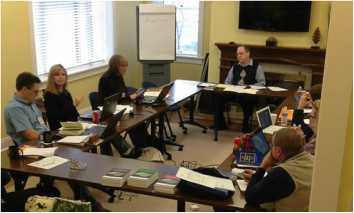 How does the Episcopal Church view and use the Bible? How does the Bible fit into our post-Christian, post-Modern age?